Createx Wicked Colors A durable multi-surface paint suited for anything airbrush including automotive, illustration and textile. Includes 2oz each: White, Black, Yellow, Orange, Red, Violet, Blue, Pthalo Green, Brown, Golden Yellow, Laguna Blue, Crimson, Reducer, 4 Color Mixing Wheel, How to Airbrush Booklet. Intended for all applications: automotive, illustration, textile, modeling and most anything that can be painted. Compatible and directly inter-mixable with Auto Air Colors. Not compatible for direct mixing with Createx Airbrush Colors. Multi-surface: aluminum, textile, weed, soft plastics, synthetic fiber, fiberglass, treated metal, glass, paper, canvas, brick, concrete. Compatible with all types of urethane primers, paints and clears as well as most all other types of primers and clears such as epoxy and water-based materials. Transparent colors that dry to a matte finish. Wicked Detail Colors are available in a full palette of artistic colors that work excellent for automotive murals, illustration, modeling and more. Wicked Colors is an ultra-high performance, multi-surface airbrush paint suitable for any substrate from fabric to automotive applications. Wicked Colors are perfect for t-shirts, automotive graphics, illustration and most any application. Wicked contains mild amounts of solvent inter-mixed with a durable, exterior-grade resign and automotive pigments for an extremely durable paint that withstands direct, prolonged exposure to outdoors elements without washing or fading. Wicked Colors have exceptional flow and atomization right out of the bottle with most airbrush tip-sizes, including 0.2mm detail tips. Wicked Colors may be reduced with reduced with Wicked W500 or Auto Air 4012 High Performance Reducer in any ratio for improved flow, atomization and customizing viscosity preferences. All Wicked Colors are made with the same highly durable binder. Wicked Colors are sheered to a binder size of 0.5 microns and dry semi-gloss level of 70+ degrees. Wicked Detail Colors are sheered to a particle size of 0.1 microns and dry to a flat finish of 30+ degrees, perfect for illustrators as a flat finish reflects the color's true hue. For automotive refinishing, a durable, catalyzed urethane clear is recommended. Wicked Colors cure to a strong film with air drying alone. Heat may be used to further assist curing and is recommended for t-shirts and fabrics intended for use with multiple washings. Heat is not required for automotive, illustration and most other applications. For more application information, visit our website's technical pages. WICKED PEARLIZED & METALLIC COLORS. WICKED ADDITIVES, MEDIUMS & UV GLOW. We are an authorized dealer for all the product lines we sell. If a listing is for a particular item then that is what you will receive. If you do want to attempt to change an order or make an address change, it is best to call our customer service department immediately. Once you pay your order prints in our warehouse for fulfillment. If you have questions on how to do this, please message us first. INTERNATIONAL ORDERING: All of our electronic items are rated for US voltage 110V. It is the customer's responsibility for knowing the correct voltage requirement of their country. If you select this option at checkout, be advised that if package is lost, stolen, or damaged, no claims can be filed. We do not mark packages as GIFT. We reserve the right to select best option. UPS cannot deliver to P. UPS Ground is used within the lower 48 US States and Canada. We will always make your order right. When contacting us please provide full UPC barcode number and/or Model Number off the wrong item you received to speed up the re-order process. NO reorders will be processed without following our policy information proccedure. Pictures may also be required to process re-order. If this information cannot be provided then claim cannot be processed. In some cases we may not need to file carrier claim. Paint Products and DVD's are excluded from this guarantee. SPECIFIC ITEM EXCEPTIONS: PAINT & DVD's - If defective or damaged they will only be replaced. We must have picture documentation of damage emailed to us on all paint related items in order to authorize a replacement order or return authorization. This listing is currently undergoing maintenance, we apologise for any inconvenience caused. Sellers: Get your own map today. 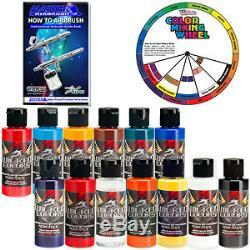 The item "12 Createx Wicked Colors 2oz Airbrush Paint Set with Reducer & Color Wheel" is in sale since Tuesday, July 30, 2013. This item is in the category "Crafts\Art Supplies\Airbrushing".